Afro Samurai will be demoed to the public for the first time at this week's Comic-Con International in San Diego, Namco Bandai announced today. The playable demo will give gamers a chance to check out what looks to be a pretty stylistic fighter based on the Samuel L. Jackson executive produced anime series. There will also be an Afro Samurai panel on Thursday featuring the creators behind the show. Panelist members will include Samuel "Snakes on a Plane" Jackson, THe RZA, Takashi Okazaki and Leo Chu. The group plan to talk about the development process, dish on some behind-the-scenes anecdotes and explain the inspiration behind the characters, music and story. Santa Clara, Calif., (July 23, 2008) – NAMCO BANDAI Games America Inc., announced today that the battle to become #1 begins at Comic-Con International: San Diego (July 23-27, San Diego Convention Center) with sneak-peak demos of the Afro Samurai® video game. Based on Spike TV's critically-acclaimed anime series starring and executive- produced by Samuel L. Jackson, Afro Samurai the game blends urban hip hop culture with traditional Japanese aesthetics to create a brutally fresh cinematic, interactive experience. The playable demos (located in booth# 5037) will provide attendees an early glimpse at this high-style action adventure game before its Q1 2009 release for the Xbox 360® video game and entertainment system from Microsoft and PLAYSTATION®3 computer entertainment system. The Afro Samurai anime series is produced by Japanese studio GONZO in association/partnership with GDH K.K. and FUNimation Entertainment. Adding to the Comic-Con excitement, an Afro Samurai panel will be conducted on Thursday, July 24 (4:15pm – 5:15pm; Room 6B) featuring the creators behind the hit series including star and executive producer Samuel L. Jackson (The Spirit), musical artist The RZA, (Kill Bill), original creator Takashi Okazaki, and executive producer Leo Chu (Spike TV). This will be a rare opportunity to hear from the talent behind the Afro Samurai franchise and how it translates to different platforms such as video games and the anime series. Hear first-hand about their experiences in the development process, behind-the-scenes anecdotes, and their inspiration for the characters, music and the story. Be the first to see the worldwide premiere of the exclusive Comic-Con trailer, dazzling artwork from the manga, and never-before-seen demos of the pulse-pounding video game. In Afro Samurai, follow Afro in his tale of revenge as he searches for his father's murderer and the holder of the coveted number one headband. The game follows the plot of the original anime series with added material and background for fans and new comers alike. Blood is beautiful™ in this hip hop infused action adventure as Samuel L. Jackson reprises his role as Afro and Ninja Ninja, his wisecracking sidekick. 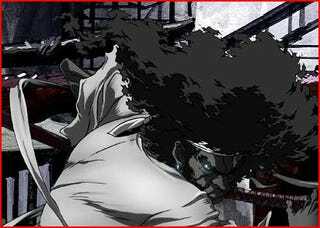 A striking cross-hatch art style gives Afro Samurai a truly unique look and feel across beautifully animated open environments as he wages war against his adversaries to become number one. Using an innovative gameplay system, enemy A.I. is affected by the beat of the musical score supervised by The RZA of Wu-Tang Clan fame. These dynamic battles ensure stylized encounters throughout the game that affect the overall tone of gameplay. Slice and dismember opponents as Afro acrobatically leaps from one location to the next, interacting with anything and everything in the environment to help him on his journey. For more information about Afro Samurai, please visit: http://www.namcobandaigames.com or www.afrosamurai.com.